What is the Microsoft Surface Go? Watch any recent advert for Microsoft’s Surface Go, and you may have got the impression that this is a nifty little 2-in-1 laptop computer. If that’s the case, then I’m here to tell you this isn’t strictly true. 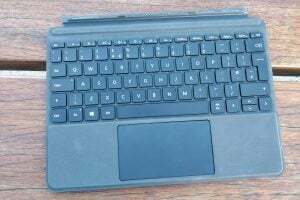 The Surface Go is actually more of a tablet, and the Type Cover keyboard dock you see in all Microsoft’s promotions isn’t bundled in the box – it’s an optional £100 add-on. 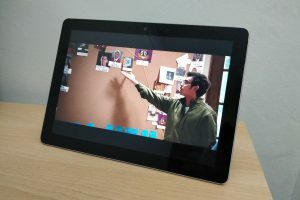 Plus, the Surface Go’s processing power is more on scale with the likes of the 9.7-inch iPad and the Samsung Galaxy Tab S4, rather than any true 2-in-1 laptop. This isn’t necessarily a bad thing, though. For the Surface Go looks to make up the lack of power with portability and versatility. With Windows 10 in S Mode installed, this machine is an enticing alternative for those who feel Android and iOS are too limiting. And if you’ve got the money then the Type Cover, Surface Pen and Surface Mobile Mouse help to make the Surface Go into a serious workaholic. 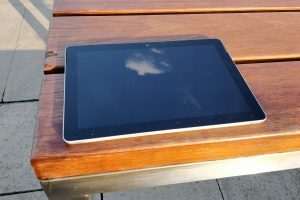 I reviewed the 128GB + 8GB model here, which is the top-end Surface Go. The only difference with this device and the cheaper version are the amount of RAM and storage. These days, it’s difficult to find a device that feels premium yet is also durable enough to survive an impromptu meeting with the floor. 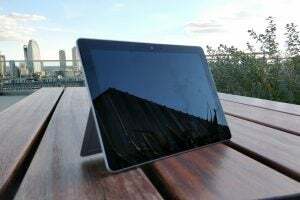 While the Surface Go isn’t a ruggedised toughbook, I wouldn’t be too worried if a toddler were to get their mitts on it; the magnesium frame appears sturdy enough to endure a wallop or two. This stability also extends to the kickstand. You can prop up the Surface Go on a table during a train journey without the worry of it wobbling. The stand has a pretty flexible hinge, too, allowing the device to be tilted at various angles. I found this flexibility super-useful, whether to avoid glare or let me get into a more comfortable viewing position on a commute or in bed. In terms of appearance, the Surface Go looks just okay. While the silver finish and shiny Windows logo at the rear look rather fancy, the front is pretty plain-Jane. Compared to other 2018 devices that have minimised bezels almost out of existence, the Go’s frame is chunkier than a Double Decker chocolate bar. One of the reasons that Microsoft decided to opt for such big bezels could be the speakers. These front-facing drivers make a lot of noise. I could leave the Surface Go in my bedroom and still hear the laugh-a-minute American Vandal interrogations from the next room. Fortunately, those sizeable bezels don’t translate to heft. The Surface Go is pleasingly light at 522g. Sure, this is heavier than both the 9.7-inch iPad and Galaxy S4, but in return you get a slightly larger screen and a kick-out stand – a great trade-off, in my opinion. You won’t find any buttons on the front of the Surface Go, which makes the decision to go for such big bezels even more bizarre. In fact, the only clickable items here are the power and volume buttons up-top. Sadly, this means no fingerprint sensor, although you can unlock the device with face recognition via Windows Hello instead. At the bottom of the Surface Go is a keyboard connector. As already mentioned, a Type Cover isn’t bundled in. However, at least you won’t have to bother with Bluetooth if you do decide to invest in the accessory. Ports, too, are in short supply. There’s a 3.5mm headphone jack, a USB-C and the Surface Connect Power Port. This is pretty much the standard these days, but on more than one occasion I found myself wishing for more ports. The Surface Go’s 10-inch IPS screen is solid. For multiple Netflix binge sessions, you couldn’t want for more. Colours are punchy and realistic – something the scatological horrors of American Vandal season two made uncomfortably apparent. Contrast is fantastic, too, with the 1096:1 rating helping gloomy scenes in Ozark, for example, stand out more vividly. Impressive black levels of 0.2057 nits also contribute to a decent overall image. However, at 225 nits, the Go’s screen isn’t the brightest. This shouldn’t pose a problem for indoor use, but take the device outside on a sunny day and you’ll likely have to squint to see the screen. Graphic designers and comic book creatives should be happy with the 92.80% sRGB score. For a tablet, the colour gamut is reasonably accurate. Colour temperature is admirable at 6382K, just a little on the warm side. The Surface Go isn’t up to the required standard for photographers, however; Adobe RGB and DCI-P3 scores are 65% and 68% respectively. But this isn’t really an issue, since the Surface Go isn’t intended for professional photo editing. Even if the Surface Go did have a more accurate display, its meek processor and lack of a dedicated GPU means it’s not at all suitable for intensive Photoshop work. Think of the Surface Go as a 2-in-1 device, and you’ll likely be disappointed by its performance power. Even the HP Envy x360 and LG Gram, which are hardly renowned for being powerhouses, flatten the Surface Go’s benchmark scores. This shouldn’t be too much of a shock, though, considering the Surface Go’s Intel Pentium Gold Processor 4415 CPU. The Surface Go’s Geekbench single- and multi-core scores of 2091 and 3980 respectively are more comparable to rival tablets. That said, even the 9.7-inch iPad comfortably trumps the Surface Go with a Geekbench 4 single-core score of 3525 and Geekbench 4 multi-core score of 5972. That’s pretty damning. That said, I’ve rarely encountered issues with the Surface Go during simple tasks such as web browsing, writing in Google Docs and streaming videos. That’s probably due to the 8GB of RAM under the hood, supplied with the top-end model. You’ll only really notice an issue with strenuous software or when you open dozens of tabs. As I said before, this isn’t a machine for editing photos and video. The Surface Go isn’t suited for gaming, either. With an integrated graphics card and a low-speed CPU, you’re limited to the likes of Angry Birds here. On a more positive note, you get oodles of storage with the high-end model – the SSD boasts 128GB. During our testing process, read speeds came in at 1116MB/sec and write speeds were shown to be 130MB/sec. For full disclosure, we did previously test a Surface Go which appeared to be faulty. When streaming video, either the screen would go blank, or the audio would drop out. Occasionally, both would happen. In some cases, the Surface Go would even shut down entirely without prompt. Microsoft did replace the model and we’ve experienced no such issues since. One of the biggest boons of the Surface Go is that it runs on Windows 10 in S Mode. This means users are allowed more freedom then they’d have with Android and iOS tablets. Not only do you have access to all of your favourite apps, but you can also download and install various programmes that would be blocked by an iPad. You get the option to purchase Microsoft Office, which could be useful for students and office workers. However, Windows 10 can be a little awkward without a keyboard. While it’s super-easy to bring up the on-screen keypad and type in simple search terms, navigating through Windows 10 menus and attempting basic editing tasks – such as copy and paste – can be a pain. I was crying out for the precision of a touchpad or mouse, which makes it even more frustrating that the Type Cover doesn’t come bundled. In tablet mode, the Surface Go offers a pretty decent battery life. During our standard battery test of looping video with brightness set to 150 nits, the Go managed to hit the 10-hour mark. Of course, crank up the brightness and battery life will suffer, but Microsoft’s suggested nine hours of video playback is still certainly reasonable. It’s a different story once you attach the official Type Cover, though. While carrying out just basic tasks such as writing on Google Docs and scouring the web, the Go lasted a pitiful 3hrs 30mins. That probably won’t be enough to get you through a couple of university lectures without reaching for the mains adapter. With this in mind, it’s certainly worth considering buying a Bluetooth keyboard and mouse instead, even if they’ll be more difficult to cram in a bag. If you’ve bought the Surface Go in order to work, whether you’re a student or at the office, the keyboard becomes an essential purchase. You definitely won’t want to be tapping out essays on the touchscreen keypad. Is the keyboard worth that much dosh, though? Probably not. Don’t get me wrong, there’s little wrong with it. It offers a surprisingly good tactile feel. Obviously, nowhere near the standard of a mechanical keyboard, but still significantly better than you may expect from a Type Cover. The touchpad, too, feels great. It isn’t too dissimilar to one that you’d find on a proper laptop. Plus the Type Cover makes a fantastic makeshift case when you’re on the move. But at the end of the day, you’re spending £100 for it. For the same price you can get a far superior keyboard packed with plenty of great features. Sure, you’d probably miss out in terms of portability if you opted for an alternative, but the Surface Go Type Cover still feels overpriced. And then there’s the Surface Mouse and Surface Pen. 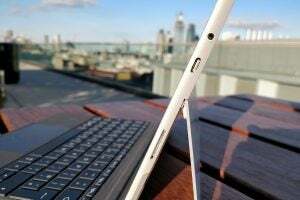 The former is a great buy for the Surface Go at only £30. As said previously, switching between the on-screen keyboard and touch navigation can be really fiddly, especially in Windows 10 menus, so Microsoft’s mouse offers welcome precision. Saying that, if you do decide to pay up for the official type cover, I found the touchpad to be perfectly adequate. The Surface Pen, meanwhile, doesn’t feel like a great fit for the Surface Go. As stated before, this Microsoft machine is certainly not aimed at creative professionals – you’ve got the Surface Pro for that. Sure, you could still use the Surface Pen for low-demanding art apps, but when you’re lumping out £100 for the thing, you’re unlikely to feel that you’re getting your money’s worth. Why buy the Surface Go? I’ve really enjoyed using the Surface Go. It’s super-light, has just enough power to sail through basic tasks, and is incredibly versatile thanks to the kick-stand and the Type Cover. However, the big issue is that once you’ve bought both the Surface Go and the Type Cover, you’ll be exceeding the cost of the equivalent iPad and accessory by a significant margin. And while the Surface Go is far cheaper than the Galaxy Tab S4, Samsung bundles the S-Pen with its tablet to make up for the increased price. 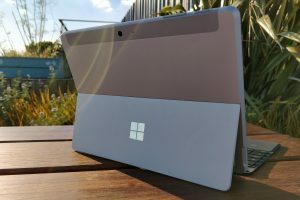 The steep cost of the Surface Go and the Type Cover wouldn’t be too much of an issue if the device had the performance to match the iPad and Tab S4. Unfortunately, it lags behind its competitors in terms of benchmark scores. So is there any reason that you’d pick the Surface Go ahead of the other two devices? Sure, Windows 10. Microsoft’s operating system arguably gives users far greater freedom than Android and iOS. 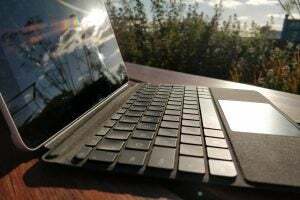 And, if you, or where you’re working or studying prefers Microsoft Office to Google Docs, then the Surface Go could prove to be the superior option for bashing out essays and reports. 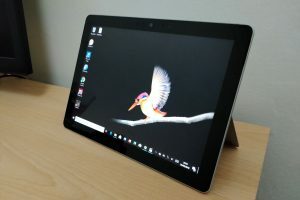 With the middling performance and not-cheap cost when you factor in the Type Cover, the Surface Go can’t quite reach the heights of the 9.7-inch iPad, but the relative versatility that Windows 10 offers means the ultraportable Surface Go is still a solid alternative. The post Microsoft Surface Go appeared first on Trusted Reviews.